As we celebrate Our Lord Jesus’ birth, we thank you for your kindness to our mission. Thanks to you, Christmas midnight Mass will beam throughout 100,000 square miles of remote village Alaska this year, as it has since 1971. Listeners tell us that in December, with less than four hours of low sunlight a day, our dot on the radio dial brings great warmth and brightness into their lives. As you'll see in this issue, our mission has just taken home several more awards for doing just that. 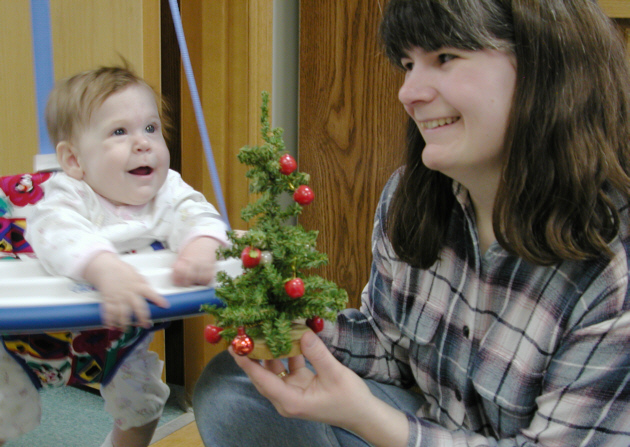 TREES A CROWD (left): six-month old Josephine Albers catches sight of her first little Christmas tree, as mom Connie unpacks ornaments in the station’s upstairs office. A KNOM volunteer 1997 -99, Connie has continued working for the mission as development assistant. TALL TALES: During the Advent and Christmas seasons, you’ll hear a fine blend of hymns and carols over KNOM. Most of the inspirational spots offer Christmas themes and prayers, and many of the educational spots explain the origins of Christmas traditions. Leading up to Christmas, you’ll hear a special Christmas story every day. From an extraordinary production of Dickens’ “A Christmas Carole” in 1973, through 2001’s volunteer-written “Arturo’s Christmas Lesson,” it’s a great wealth of radio Christmas plays produced by KNOM volunteers each year. OPENING CREDIT: Many of our friends have asked for it, and it’s almost ready. In November, we successfully used a credit card to make a test donation to our mission. Next month, we expect to include a coupon with the “Nome Static” that will allow you to contribute this way, if you choose. You will also be able to contribute via our web page, www.knom.org. Please let us know what you think about KNOM’s using this new technology. CHRISTMAS INSPIRATIONAL SPOT: Just as Jesus at his birth drew wise men from afar, today he draws people of all backgrounds to Himself. People all over the world, whether consciously or unconsciously, are searching for the Truth and Life found in Jesus. There is not one person to whom Jesus does not wish to manifest His Presence and His Love. top TAKING PAWS: (left) Dog pounds, dog teams, dog care, dog food, dog bites, barking dogs, pet dogs, loose dogs. KNOM volunteer Emily Barrett recently produced and hosted a lively and interesting “Sounding Board” call-in program that touched on just about every topic you could name dealing with our canine friends. 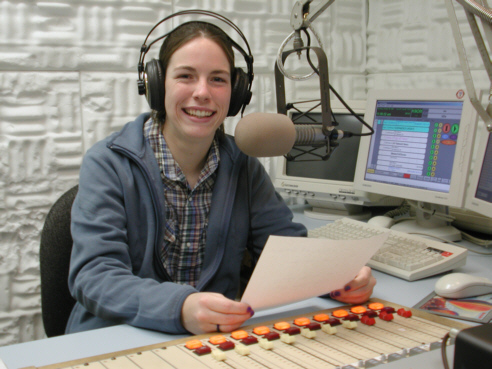 Congratulations to Emily and to fellow staffers Paul Korchin, Amy Flaherty and Julia Dunlap, who share the production of “Sounding Board,” which was honored in November as “Best Radio Public Affairs Program” by the Alaska Broadcasters Association! SEATED: In November, KNOM business manager Florence Busch was re-elected chair of the St. Mary’s Native Corporation, based in her hometown village of St. Marys, about 175 miles south of Nome, in the heart of KNOM listening country. Yay, Florence! EARTHQUAKE: General manager Tom Busch was at work Sunday, November 3rd when that massive 7.9 earthquake struck central Alaska. Tom immediately pulled on his old newsman hat and kept listeners informed throughout the afternoon. Near the remote epicenter, a couple of hills were lifted three to six feet. In one place, the earth’s horizontal movement was an astounding 25 feet. As you know, there were no serious injuries. Nome is about 500 miles west of the quake’s center. No one can explain it: although effects of the quake were experienced thousands of miles away, nobody in Nome saw or felt a thing. DANCE! (left) We were hoping that this image would fit into the print version of the "Nome Static," but there just wasn't room. 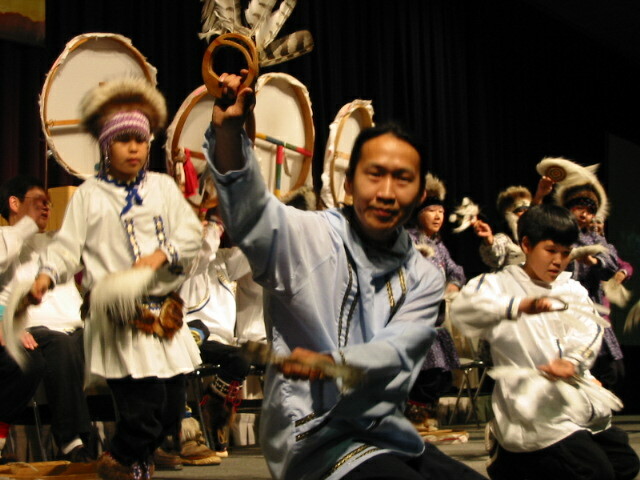 While covering the massive Alaska Federation of Natives annual conference in Anchorage, KNOM news director Paul Korchin took several images of Native dance performances, like this engaging one. And, yes, Native dancing can be as fun as it looks! KNOM is the oldest Catholic radio station in the United States, broadcasting to Eskimo, Aleut and Athabascan Indian villages throughout isolated western Alaska. Our only source of income is good people like you. Thank you for your support and your prayers! CHRISTMAS INSPIRATIONAL SPOT: In Mary’s life, we find a blend of surrender to God, integrity and inner strength. CHRISTMAS INSPIRATIONAL SPOT: It’s Christmas. Let’s love...now that God has shown us how. top STELLAR PERFORMANCE (left) KNOM volunteer Julia Dunlap checks out the KNOM Christmas star, which has proclaimed Christ’s birth from high over Nome since 1971. For over ten years, its electricity and maintenance have been provided by an anonymous Nome donor. WE PROMISE that we will carefully and prayerfully use your gifts in the most effective way possible to operate our mission. WE PROMISE that our mission is free of sexual misconduct of any kind. “Since I was given total responsibility for KNOM in 1988, I am not aware of a single problem,” general manager Tom Busch says. All employees and volunteers are formally trained to spot sexual misconduct, and to report it if it should occur. WE PROMISE that we will never rent or give your name and address to anyone. This is a promise we have made and kept since we began raising funds for our mission in 1966. THIRTY YEARS AGO: December 1972, volunteer chief engineer Tom Busch hauled a “new and improved” lighted star atop KNOM’s studio tower. 1971’s had blown apart in the wind. In fact, several additional models fell victim to the brutal Nome weather until engineer Timothy Cochran devised a hurricane-proof model in 1995. Months before, the crew had driven 60 miles to the nearest trees and had chopped down an 8-foot black spruce for Christmas. Unfortunately, they had placed it under a roof gutter. Two weeks before Christmas, they discovered that it was encased in about 500 pounds of ice! After lots of chopping, they rescued the top 2-1/2 feet of it. Please consider adding missions like KNOM to your will. We prayerfully place all bequests into funds that provide for future major improvements, or protect the mission against emergencies. INSPIRATIONAL SPOT: Lord, hold our troops in Your Loving Hands. Protect them as they protect us. Bless them and their families for the selfless acts they perform for us in our time of need. Amen. INSPIRATIONAL SPOT: Dear God, as the year’s end nears and nights are long and cold, we think about things that warm us, like quilts and blankets, each one made of many pieces, different colors, sizes and shapes, all stitched together to form a thing of service and beauty. top TAKING IT PERSONALLY (left): At the Alaska Broadcasters Association annual meeting in November, the group honored KNOM program director Ric Schmidt with the 2002 President’s Award. Ric, the group’s vice president, was recognized for hours of behind-the-scenes work on behalf of the state’s broadcast industry. 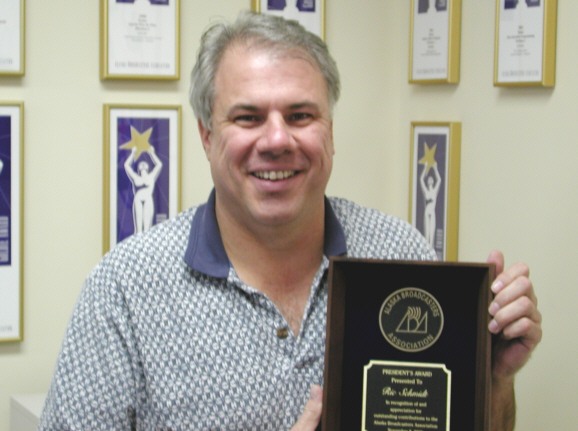 A 19-year broadcast veteran, Ric has served as KNOM’s program director since 1995. Congratulations! Best Radio Specialty Program, for a show entitled “No Ordinary Man,” Lynette Schmidt, producer. Best Radio Web Site, Tom Busch, webmaster. Best Radio Live Sports Event for the Nome turnaround of the 2,000-mile Irondog Classic snowmobile race, Paul Korchin and John Hall, reporters. Best Radio Public Affairs Program, our weekly “Sounding Board,” Paul Korchin, producer. Best Radio Service to the Community, ABA’s highest award. Our hats are off to everyone on the KNOM staff whose dedication and talent has earned the recognition of our peers in Alaska broadcasting. SOUND ADVICE: Please check our web site, www.knom.org/realaudio, where you’ll find not only lots of photos and information, but also recordings of some of our inspirational spots and programs. Among others, you’ll hear samples of volunteer Amy Flaherty’s “KNOM Profile” interviews, which we hope to update weekly. THANK YOU to everyone who contributed toward our new Toyota 4-Runner. November 19th, its two-way radio was installed, and it was ready to go. Please look for a photo in January! We offer you our prayers for a blessed and happy Christmas for you and for everyone you love. Thank you once again for your help for our mission. From everyone on the KNOM staff, may you and those you love enjoy a merry and blessed Christmas! CHRISTMAS INSPIRATIONAL SPOT: Christmas. It’s God’s invitation to us to approach Him and embrace Him in our lives.